The county's new webpage tracking the new courthouse project is seen in this screen image made Feb. 21, 2018. 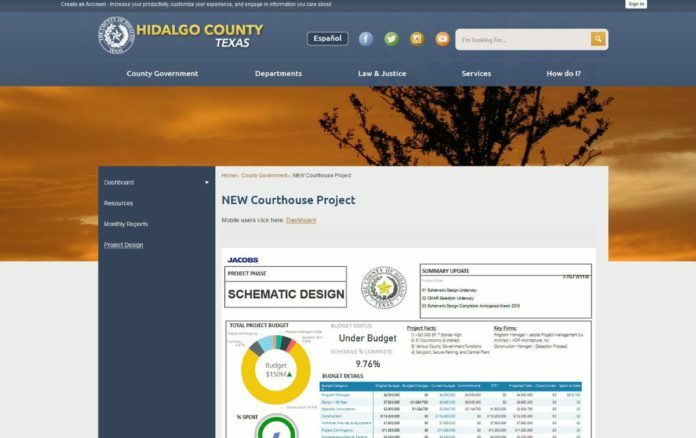 EDINBURG — The Hidalgo County website now includes an interactive page that tracks the spending and progress of the new county courthouse in an effort to make the project more transparent. The page was created by Jacobs Project Management, which serves as the program manager, with help from the county’s information technology department. The site includes a breakdown of the budget, a proposed schedule and offers viewers a log of contracts and invoices related to the $150 million endeavor. Staff at Jacobs will produce a monthly progress report for commissioners that will help generate the content for the site. The courthouse is still in the schematic design phase, with both Jacobs and HDR Architecture Inc. in the process of revising the design. That process is about 70 percent complete, and a finalized version should be available by mid-to late March, according to the page. “It sort of gives you these key highlights of when we expect things to happen,” Sarfati said. The site also indicates the project is currently “under budget,” though it does not appear to include all the expenditures Hidalgo County has made in connection with the project. Out of a $150 million budget, the county has only paid out about $612,000 — or the equivalent of .41 percent of the total cost — to Jacobs, according to the information on the page. That figure, however, does not include costs such as the $1 million the county spent last year on acquiring the reverter clause for land where the courthouse sits, or any expenditures associated with the initial design of the facility that was made several years ago. Those design expenses, however, were incurred before Jacobs came on board. Since then, Hidalgo County commissioners have entered into two different contracts, totaling $13.5 million, with $4.5 million going toward Jacobs and $9 million to be paid to HDR. Those expenditures are the only ones reflected on the page. The site also includes an interactive breakdown of costs, such as the budgeted amount for furniture and fixtures, which currently stands at just under $8 million. The actual construction cost of the building is estimated at $113 million. Jacobs estimates the project is about 9.7 percent complete, with a projected completion date set for July 2022. Hidalgo County Precinct 1 Commissioner David Fuentes suggested the page be placed in a prominent location on the county’s website, www.hidalgocounty.us.